2376 THE LONELY PASSION OF JUDITH HEARNE (1987) Actor. 7172 ANNE OF GREEN GABLES (1985) Actor. 13142 THE COMEDY OF ERRORS (BBC) (1983) Actor. 1227 THE CAT AND THE CANARY (1980) Actor. 72 THE ELEPHANT MAN (1980) Actor. 13131 RICHARD II (BBC) (1978) Actor. 6078 MURDER ON THE ORIENT EXPRESS (1974) Actor. 1091 A MAN FOR ALL SEASONS (1966) Actor. 14384 SONS AND LOVERS (1960) Actor. 12431 SEPARATE TABLES (1958) Actor. 6286 I KNOW WHERE I'M GOING (1945) Actor. 84 MAJOR BARBARA (1941) Actor. 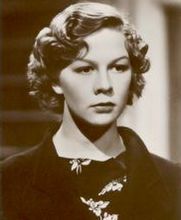 Wendy Hiller, was born on 15th August 1912 in Bramhall, near Stockport, Cheshire, England. She appeared on stage in Sir John Barry's tour of Evensong, then as Sally Hardcastle in Love on the Dole.The huge popularity of Love on the Dole took the production to New York in 1936, where her performance attracted the attention of George Bernard Shaw. Shaw recognized a spirited radiance in the young actressand cast her in several of his plays, including Saint Joan, Pygmalion and Major Barbara, the last two were adapted for film with Hiller playing the starring roles. For someone who lived to 90 it is a shame that she starred in relatively few films. That said, a large number of her films such as Pygmailon, Major Barbara, Separate Tables, I Know Where I'm Going and The Life and Death of Colonel Blimp are musts for fans of film.